Never worry about giveaway items again! 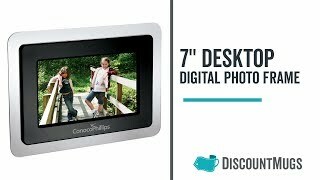 These custom desktop digital photo frames will do the job perfectly! Made with high quality materials, these items are not just durable, but also very functional! It looks great too! Clients, customers, and colleagues will surely be thrilled to receive amazing giveaway items such as these! Moreover, these digital photo frames also feature 7" LCD screen, 480 x 234 pixels resolution, and supports JPEG files, SD, MMC, MS, and XD card cards. It's just the perfect gift and everyone will surely be impressed with it! Customizing these personalized digital photo frames is very easy too! Simply upload your design into our online design lab system, do all the editing there, and see the results via a virtual sample. Our artists and customer representatives are always willing to assist you in any way. Order these custom desktop digital photo frames now and make your event a day to remember!